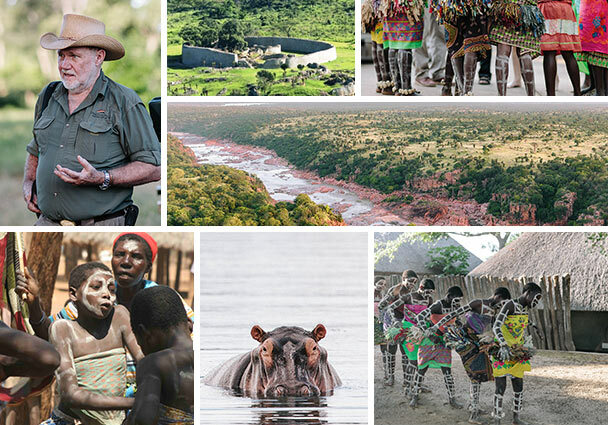 • Discover the Shangaan people with Clive Stockil, the winner of a Lifetime Achievement Award for Conservation from the Prince of Wales on behalf of Tusk. • Experience the Mahenye festival, a fun and colourful event in remote SE Zimbabwe. • Enjoy a breathtakingly beautiful safari in the Gonarezhou area; imbibe the delights of a palm wine tasting session and sundowners by the Chilojo cliffs. • Be transported by the brilliant story telling of Paul Hubbard who will take you on an historical journey to former civilisations and bring to life the feats of great entrepreneurs, adding a whole new dimension to your safari. • Marvel at the Great Zimbabwe Ruins, the largest stone structures south of the pyramids and a monument to a trading empire which was thriving whilst we were being ravaged by the Black Death. • Listen to tales of the first white martyrs in Rhodesia; stand and admire “God’s own Window” in the Matopos Hills, a UNESCO site and burial place for Cecil John Rhodes and the mighty first king of the Ndebele people, Mzilikazi Khumalo. £4,175 per person excluding international flights. Maximum group size:10. Additional extensions by arrangement. The Forgotten Island with 5,000 “saints”. 18th -26th November 2016 with specialist guide, Aaron Legg. • The islanders of St Helena are called saints…well, they do worship at the oldest Anglican church in the southern hemisphere, are wonderfully friendly, and have a strong sense of community. Car keys stay in cars around here. • The island, 1,200 miles west of the African coast and 2,500 odd miles east of Rio de Janeiro, with its rugged scenery comprising verdant valleys, sand dunes and craggy bays where whales can be seen breaching, is perfect for nature lovers. 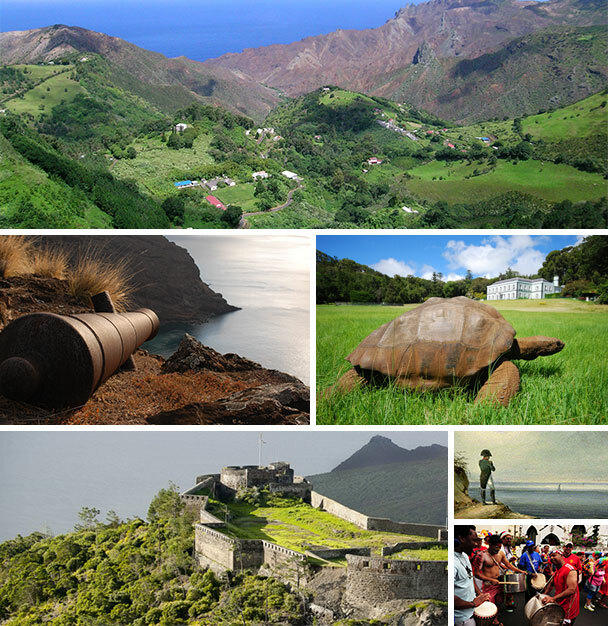 • It is just possible that Jonathan, St Helena’s most famous living resident, was born at about the time Napoleon Bonaparte, the island’s most famous departed resident, died: 1821. Jonathan is a giant tortoise and could, at around two hundred years of age, be the oldest living creature in the world. You can see him moving very slowly about the gardens at the Governor’s Residence. • Getting to this island has always been a slow process, involving a five-day boat journey on RMS St Helena from Cape Town, but from this summer access will be transmogrified in the form of a once-a-week service by Boeing 737 from Johannesburg. • The Portuguese, the first great sea-going empire builders, found the island in 1502, keeping their discovery a secret for over a hundred years until the British, by then the dominant power in these waters, laid claim to it in the middle of the 17th century. • Aaron will take you on informative explorations each day around the island to see some of the four hundred endemic species including the critically endangered wire bird. You will hear historic tales, picnic with dramatic scenery as a backdrop and maybe taste some of the most expensive coffee in the world. £2,600 per person excluding international flights. • Journey up the Sepik river to the Amazon of the south to see villagers who have hardly ever stepped on terra firma living on floating islands. • Witness the initiation of young men in a tribal ceremony involving the ritual scarification of their backs (not obligatory). • With a ratio of about six guides to only thirty-six guests on board, you are assured of personal attention. • This luxurious boat is an adventure platform with six proper speed boats as expedition craft, not Zodiacs. • True North has a shallow draft so really can travel to the parts other boats cannot reach. • An on-board helicopter is ready to take guests on amazing scenic flights. • This ship is for guests who want to discover unusual and difficult to reach destinations. • No casinos or swimming pools. No extended periods at sea. From £10,253 per person excluding international flights. 11 nights. 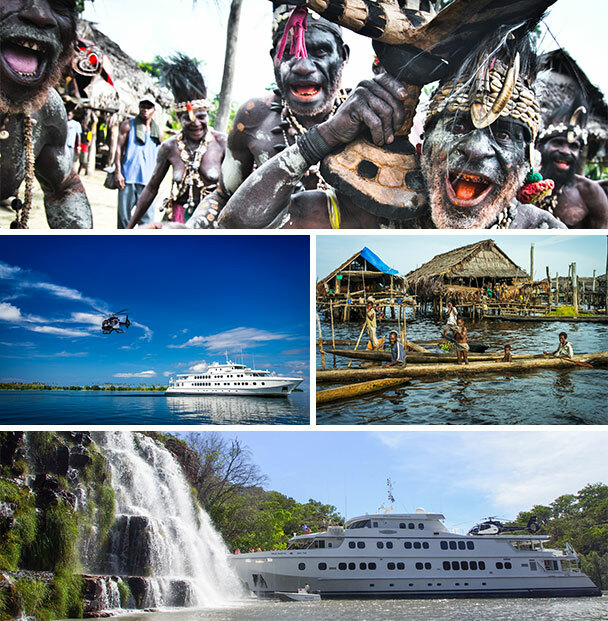 Includes flights from Cairns to Papua New Guinea by charter. Other shorter boat journeys from £2,000 per person in Australia. For further information please contact Miles on 0207 723 5858.